What do beautiful mountains, a forest with dense canopy, higher education institutions, and a former limestone mine have to do with the newest innovations in unmanned aerial systems or drones – an emerging industry with potential for more than $98 million in expenditures over the next 10 years? As it turns out, there is unique opportunity presented by this mix of assets in the Alleghany Highlands area of the Greater Roanoke Region of Virginia. The region is now working to implement an industry strategy that includes a drone technology center that will serve as training and testing bed for those seeking to fly recreationally and for those actively working to develop the next generation of drone technologies. The region’s mountainous terrain has been a tremendous asset in attracting drone-racing events to the region. A community leader’s passion for new technology helped discover and unlock this potential. Steve Bennett, chairman of the Alleghany County Board of Supervisors, recognized the area’s unique potential for the drone industry and was instrumental in organizing the first annual Flying Circus Festival in May 2016, an event that attracted roughly 100 drone-racers to test their flying skills in two race courses including a unique subterranean flying course set up in a former limestone mining operation. The events served as qualifiers for the World Drone Racing Championships. The community hopes to double participation in the local event set for May 18-21. Dense forest is another important asset supporting a drone industry strategy. The area has also been working to establish a drone-based search and rescue training program for first responder personnel through a unique partnership between Dabney S. Lancaster Community College, James Madison University, and Virginia Tech. The area’s hundreds of thousands of acres of national forest land are ideal to test drone-based sensor and forward-looking infrared and other technologies to detect missing individuals. Drone technology holds great potential in the forestry industry as well. Partnerships with higher education go beyond training programs. Virginia Tech, in particular, is leading the way in drone research. 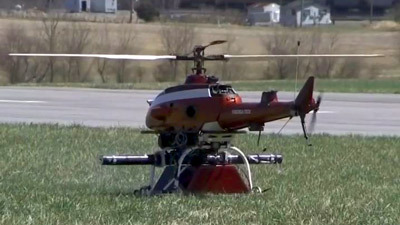 Virginia Tech is home to the Virginia Center for Autonomous Systems as well as home to an FAA-designated test site operated by the Mid-Atlantic Aviation Partnership. And, of course, Virginia Tech is home to mechanical and electrical engineering talent vital to further innovation in the industry. Proximity to Virginia Tech is a tremendous asset as drone technologies develop. Scenic beauty has long been an important asset for the Roanoke Region. Certainly, it is a cornerstone of the outdoor strategy as well as an asset that has drawn residents and visitors for many years. The Alleghany Highlands Economic Development Corporation is working with the area’s world-class resorts to establish recreational drone-flying packages to attract pilots who desire the opportunity to fly drones in a region offering unspoiled mountain views. Lastly, the region is working to establish a new drone technology center, The Alleghany Highlands Drone Zone. The facility, proposed for a former middle school, will feature indoor flying space, space for drone-related training programs, and space for drone-specific tenants including those in research and development as well as drone system and parts retail. The region has applied for federal funding necessary to support development of the center. Learn more about Virginia Tech’s work in drone research in this video from the Washington Journal. ABOUT THE VIDEO: The footage above is from a drone flying inside a mine in Alleghany County.